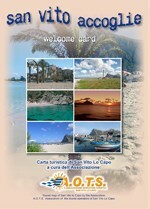 Since 2006 it is published "SAN VITO WELCOMES", a Welcome Card with regular updates of the San Vito area maps designed for tourists visiting. Foldable (without advertising) containing the maps of the Province of Trapani, the Zingaro Nature Reserve and some hiking destinations as well as telephone numbers of public utility. It is only given to members who can "customize it" with their own logo and distribute to their guests and customers. 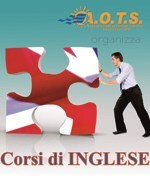 Online since March 2006, the portal associated tour operators all'AOTS. The site offers a free showcase on the web to all members allowing to receive requests for information and / or reservations for accommodations associated, for restaurants for tourist services agencies. the place to find businesses that operate in San Vito Lo Capo. Greater visibility is granted to companies that support and association activities. the official website of the festival San Vito Jazz with photos of concerts and archive of past editions of the event. 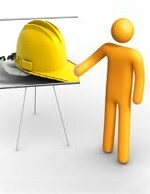 Organization and management of training courses (Hygiene and Safety) since 2007. Taking advantage of the collaboration of qualified professionals are made ​​on site the courses for nutritionists, courses on the open Security to all the tourist and commercial sector (members and non members) of San Vito Lo Capo. Organized SAN VITO JAZZ from the season 2007. A jazz festival with artists of international stature. The concerts are offered free of charge to tourists especially thanks to the contributions of the member companies. Since 2006 and until 2008 management and running of a "HOUSE OF COUSCOUS" within the event Cous Cous Fest. Thanks to the contribution of volunteer members has been able to lead a HOUSE OF COUSCOUS handing out at the demonstration thousands of Cous Cous portions. Attached to the stand an 'info point run in collaboration with the Institute "L. Sciascia" Erice provided tourist information in addition to the folder containing the list of shareholders with all the contact details. logistical support to the hospitality at the facilities associated with retrieval of gratuity for kite enthusiasts participants at three editions of the International Kite Festival in San Vito Lo Capo. Organized an English course of 40 hours geared for tourist accommodation and open to all tour operators of San Vito Lo Capo (Members and Non). Opting for levels of BASIC and INTERMEDIATE course we wanted to give the opportunity to attend classes also to operators who had not until then no approach with the English language.